Originally from Minnesota, Bill Ivey is a retired Infantryman who served 31 years in the U. S. Army, mostly in light, airborne and ranger units. Assignments included Fort Benning Georgia, Fort Bragg North Carolina, Hawaii, Korea, Japan, and Iraq. He had the opportunity to command units from platoon through brigade, serve as an observer/controller at the Joint Readiness Training Center, and serve on several joint and Army staffs, including US Forces Japan, chief of staff of Eighth Army in Korea and as a deputy task force commander in Iraq. 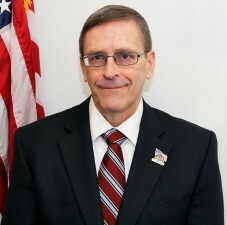 Following his retirement from the Army in 2006, he joined the Army’s Asymmetric Warfare Group, a unique unit that combined retired senior NCOs and officers with senior active duty personnel to embed with units in Iraq and Afghanistan, identify problems, develop solutions, and disseminate those solutions to units preparing to deploy. His seven years as an operational advisor with that unit took him back to Korea, Iraq, and Afghanistan. Bill joined Homes For Our Troops as its executive director in January, 2014. He resides in Georgia with his wife Debbie. They have two daughters, Heather, a mechanical engineer, and Kelly, an Army aviator.